What are the top landmarks in Lake Garda? 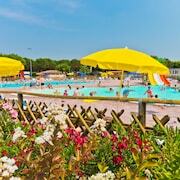 Have a fun-filled day at Gardaland and see why people love this theme park in Ronchi. While you're in the area, stroll along the lakeside. Walk on the walls, venture down passageways and climb up a tower of this ancient fortress on Lake Garda in northern Italy. Enjoy a stop at Vittoriale degli Italiani, a landmark worth seeing in Gardone Riviera. Wander the lakeside in this quaint area. Visit this Roman building known for its well-preserved mosaics and explore its museum of intriguing artifacts. Jutting out from the idyllic Sirmione Peninsular, this expansive villa offers a glimpse of how the elite lived during Roman times. Step back in time and learn more about local history with a stop at La Rocca in Riva del Garda. While you're in the area, stroll along the lakeside. Desenzano del Garda City Centre is a welcoming neighbourhood. The neighbourhood has many charming qualities, with its rich culture among the more noteworthy. Many visitors come for its beautiful outdoor setting, especially the lakeside setting. Old Town is a welcoming neighbourhood. Peschiera del Garda City Centre is a welcoming neighbourhood. Location is superb and staff were amazing. We couldn’t fault our stay and would highly recommend Hotel Eden. 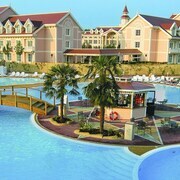 Why can’t I live in this hotel? It couldn’t get any better! Form the staff, to the room.. views of the Lake and the food it’s just beautiful and I can’t wait to go back. Lake Garda is the largest lake in Italy and one of the country’s most beautiful natural attractions. Located around halfway between Venice and Milan, the lake stretches for over 30 miles through northern Italy’s rugged countryside. The area around the lake is dotted with picturesque towns and villages, while some excellent vineyards can be found at the southern end of the waterway. In the summer months, the lake’s beaches offer the perfect place to cool off and unwind. Swimming spots can be found all along the lake’s shore, with some considerably busier than others during the peak months. If you want to avoid the crowds, you’ll need to get away from the more popular resort towns and explore Lake Garda’s hidden corners. Aside from swimming, boating and windsurfing, there’s a wide choice of activities available in and around the destination. Spend your holiday in Lake Garda relaxing by the water’s edge, exploring the nearby countryside by bike, walking the lake’s shores or relaxing in one of the region’s luxurious spas. The towns and villages that line the lake’s shore offer visitors a wide selection of accommodation options. 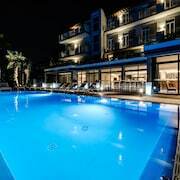 One of the most popular places to stay at the southern end of the lake is the Sirmo Peninsula. Home to the settlements of Sirmione and Colombare, the peninsula boasts a number of historic sites including the 12th century Scaliger Castle, the ancient Church of San Pietro in Mavino and Catullo's Grotto. 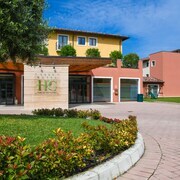 Many of the hotels in Lake Garda at the northern end of the waterway can be found in and around the village of Torbole. A popular spot for adventure sports like windsurfing, canyoning and mountain biking, it’s the perfect choice if you’re looking for an active getaway. Another great destination for mountain bikers is Malcesine. A cable car in the village takes riders straight to the top of the nearby mountain, allowing them all the fun of the descent without any of the hard work of the climb up. Bardolino, in the southeast of Lake Garda, is another popular destination for visitors to the region. A spa town, Bardolino is home to an excellent choice of high-end Lake Garda hotels as well as a choice of guesthouses and B&Bs. To escape the crowds and experience a quieter site of Lake Garda, try the hotels in the pretty village of Gargnano. Its winding medieval streets, picturesque waterfront and lush olives groves are perfect for exploring on a warm summer’s day. Alternatively, you could book a hotel in Verona, which is just 40 minutes from Lake Garda, and combine your lakeside escape with an exciting city break. 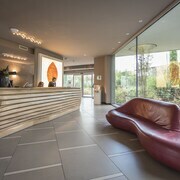 Hotels in Lake Garda come in all sorts of shapes and sizes. From exceptionally high-end villas and luxury resorts to self-catered apartments and traditional guesthouses, the region has plenty for you to choose from. If you want to experience the region’s luxurious side, book a Lake Garda hotel in one of the spa towns on the water’s edge. Offering a great range of indulgent amenities, they’re the perfect choice if you want to relax and unwind on your Italian adventure. You’ll also find high-end accommodation in some of the exquisite villas that line the lake’s shore and in many of Lake Garda’s historic towns and villages. If you’re looking for a more affordable hotel in Lake Garda, you’ll find a good selection of family-friendly hotels and self-catering accommodation in Riva del Garda, Torbole and Sirmione and many of the other larger settlements on the lake’s shore. Many of these towns and villages are also home to farmhouses and townhouses that have been converted into boutique hotels and holiday lets. From history, culture and relaxation to adrenaline-pumping adventure sports, there are lots of things to do in Lake Garda. If you want to explore the region’s rich culture, visit some of the fascinating historic sights that ring the lake. From the 12th century Castello Scaligeri in Sirmione and the colourful town of Malcesine to the clifftop Castello di Arco and the dramatic Cascata del Varone, Lake Garda has a huge variety of attractions to explore. Another way to experience an authentic side of Lake Garda is to visit the lakeside markets that take place in different towns and villages every day. Offering an array of local produce, these markets are held in the morning so you’ll need to get up and out early if you want to grab a bargain. Adventure sports available in the area include windsurfing, mountain biking, canyoning, climbing, diving and flyboarding. Alternatively, you can simply find a quiet beach and enjoy an afternoon of relaxing in the warm Italian sun. 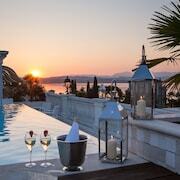 Booking your flight and hotel together can help you save money on your Lake Garda holiday. Explore Expedia today to find out more. Explore Lake Garda with Expedia's Travel Guides to find the best flights, cars, holiday packages and more!